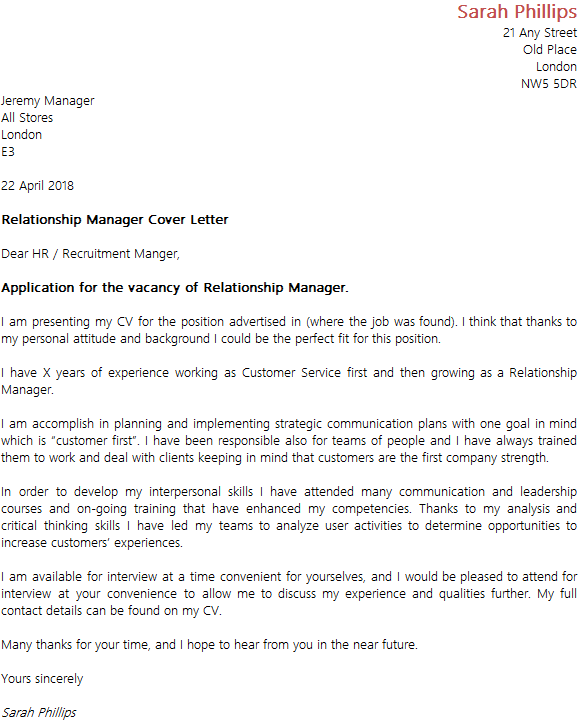 As Relationship Manager, you will be responsible for improving the relationship between the company and its customers. You will do so using efficient and tailored communication means and by implementing measures and new solution to improve customer service procedures. As a Manager, you will be also responsible for your team and you need to ensure that staff members are trained, informed on all company services and product and as well able to communicate and retain clients. Previous experience in the customer service field is an asset, together with proven communication and leadership skills. A customer-oriented vision is mandatory; people management abilities and experience are key skills for this position. Application for the vacancy of Relationship Manager. I am presenting my CV for the position advertised in (where the job was found). I think that thanks to my personal attitude and background I could be the perfect fit for this position. I have X years of experience working as Customer Service first and then growing as a Relationship Manager. I am accomplish in planning and implementing strategic communication plans with one goal in mind which is “customer first”. I have been responsible also for teams of people and I have always trained them to work and deal with clients keeping in mind that customers are the first company strength. In order to develop my interpersonal skills I have attended many communication and leadership courses and on-going training that have enhanced my competencies. Thanks to my analysis and critical thinking skills I have led my teams to analyze user activities to determine opportunities to increase customers’ experiences.